Nervous is not even the start of it. 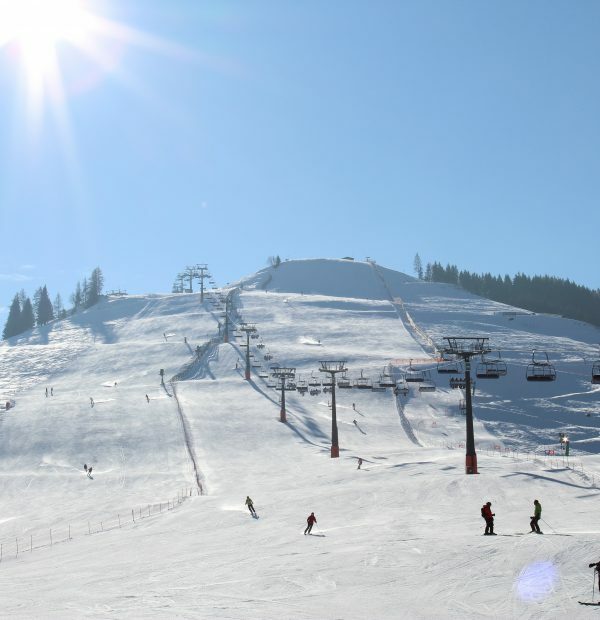 Having torn my ACL in Austria the previous year while skiing the daunting idea of going back to Austria pre reconstructive surgery to ski filled me with doubt. Would I remember how to ski? Would I even want to go on to the snow? What if I fall again? Needless to say the anxious plane journey to Munich was all but forgotten when we touched down. Greeted by Emmi Widauer, the Co-Owner of Holzhotel Forsthofalm, in their customised Tesler at Arrivals the stresses of what was yet to come all but drifted away. Emmi loaded our luggage into the car and with the close of a batwing door we were off on the autobahns of Germany (in an eco electric car none the less) heading to Austria. 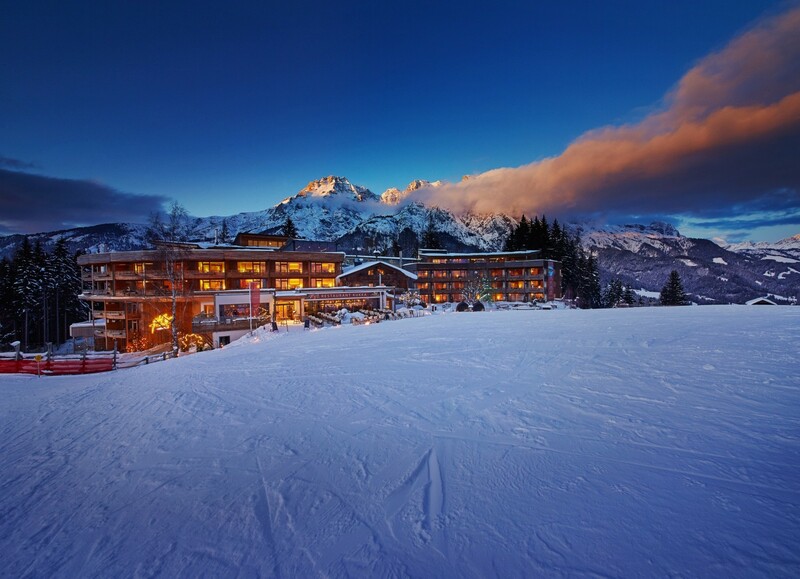 In a quiet, scenic spot surrounded by wooded slopes and mountain pastures near the village of Leogang in north-west Austria lyes Holzhotel Forsthofalm. The Widauer family opened their first timber-built hotel in 2008 and added a further seven-storey building in August 2013. Built entirely with so-called “moon timber” (wood that is felled between November and January, when trees are not producing sap, and said to “aid sleep and wellbeing”) the newest part has a rooftop pool, a top-floor Sky Spa and a spacious ground-floor restaurant. 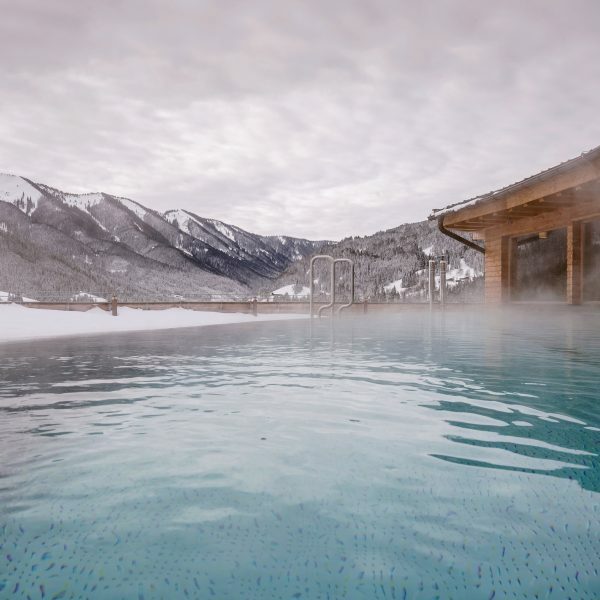 The Holzhotel is more than a wellness hotel in the mountains, the concept of Forsthofalm goes beyond its four walls, you will find an exciting way of life at an altitude of 1050 metres in the middle of the Alps due to their eco philosophy and hands on family management of the hotel. Upon arrival Emmi took us to reception and we were greeted by her charming other half Markus Widauer, whose family built the original wooden structure where Forsthofalm now sits. It was late at this point, and what was so thoughtful of the Forsthofalm was that rather than checking us in and ushering us off to our rooms they instead took us through to the restaurant so we could have some supper and not risk the kitchen being closed later. This gesture was most welcome after a long day of travelling. 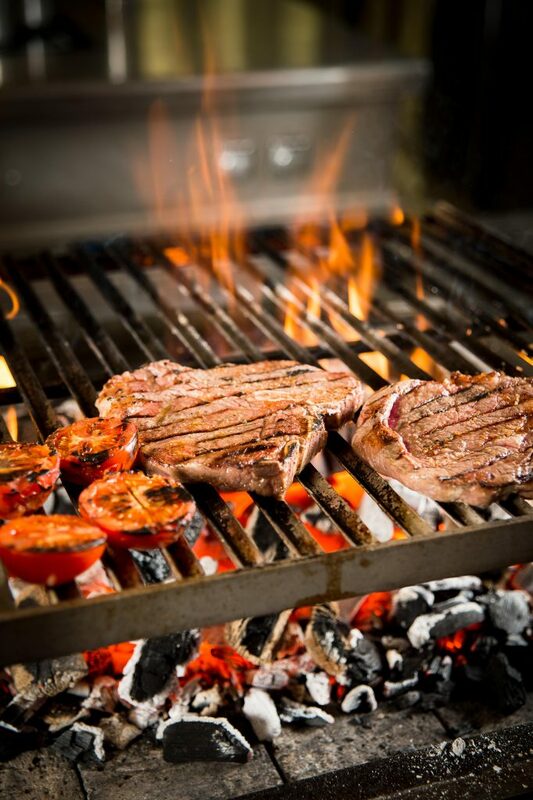 We started with some Gin & Tonics followed by some home cooked bread, soup, a rather scrummy flame grilled steak with charred vegetables and a rather good glass of Hannes Reeh Unplugged Zweigelt. Very satisfied and rather sleepy by this point Markus showed us to our suite, a Suite 180 located overlooking the slopes of Leogang. There are six levels of room at Forsthofalm ranging from “Small Eden” and “Large Eden” in the older part of the hotel, accommodating families of four or five plus with rooms for couples in the newer building. The top room in the new building is Suite 180, a luxurious space for two people with a superb panoramic view, separate sitting area and home cinema. As we stepped into the suite we were bowled over by the size and the vast amount of exposed wood. Suite 180 is 70 m² of space with high ceilings giving an even more airy feel; kitted out with a home cinema, terrace, bathroom with double access with a view over the countryside, a low lying king size bed, a dressing room and a cuddle-corner lit and warmed by the flames of the open fire this is one well equipped suite. 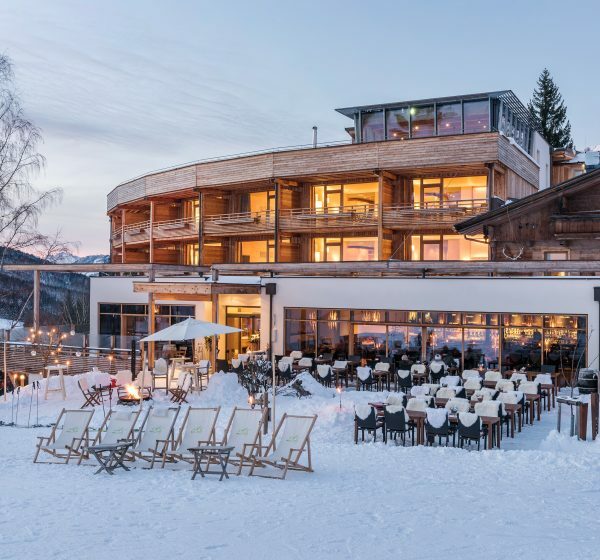 Thoroughly committed to ecological and sustainable tourism, Holzhotel Forsthofalm’s unique design and construction is free from glue and metal thus creates a natural, healthy environment. The solid wooden walls are held together by over 70,000 wooden screws and therefore totally biological. 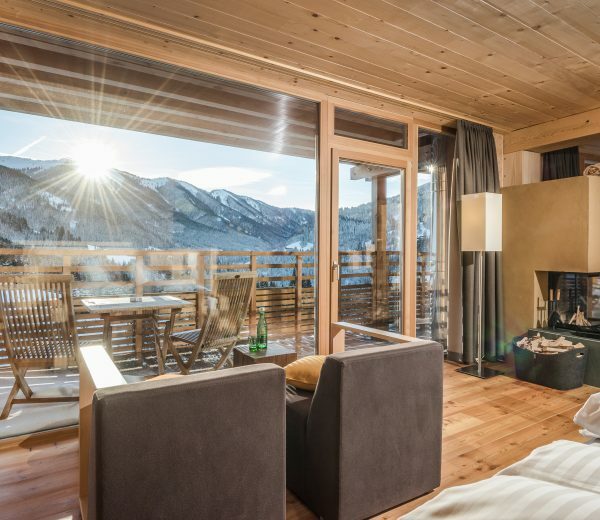 Wood, and especially the larch and stone pine used in the hotel’s construction, has proven benefits for health and well-being, a deeper, more restful sleep, a lower heart-rate and an allergy-free environment are just some of the assets of this wonderful natural material. 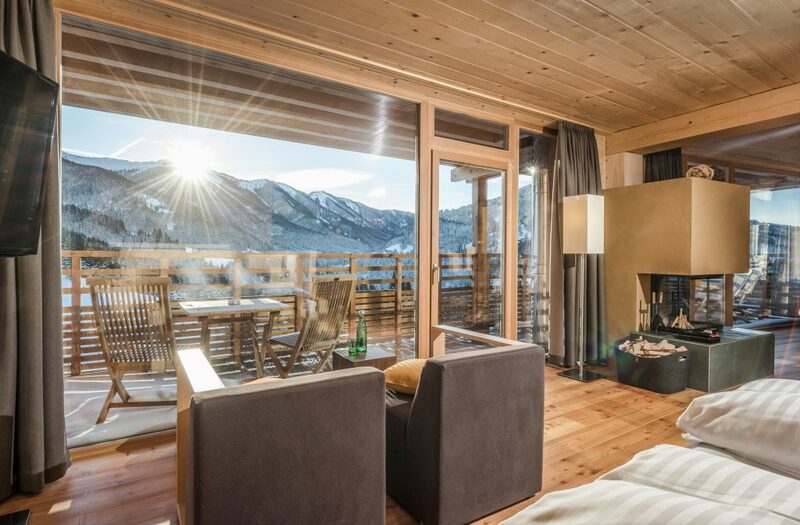 So the Suite 180 and all the other rooms at Forsthofalm not only look great but are healthy to the environment and those that reside in them, no wonder I had such a great night’s sleep! The next morning we headed to breakfast, which is a buffet affair offering all one’s favorites, but the Forsthofalm philosophy is also evident here as Vegan, Vegetarian, Raw food diet and Gluten free options are made available and not as a special request but as every day food offerings at all mealtimes. 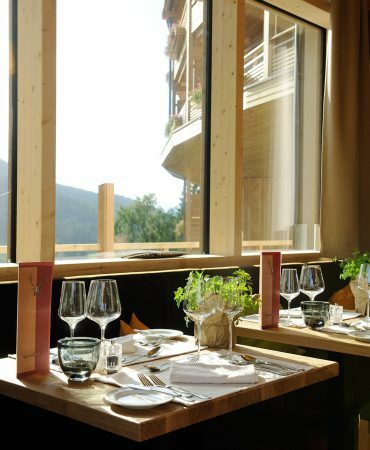 The restaurant in the Bio-hotel was christened with the unique name KUKKA, this was chosen and inspired by Emmi Widauer’s country of origin, Finland. 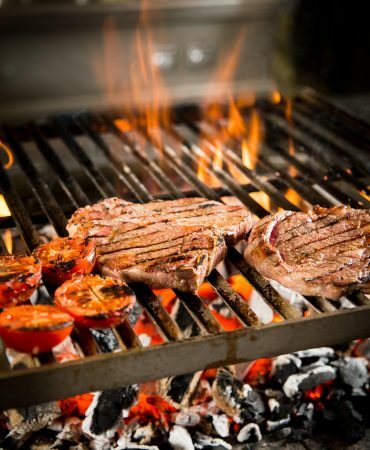 Robert Bauer, Head Chef, ensures a wide range of fresh breads are baked on the premises daily and a further speciality is the organic meat and fish which is grilled on the restaurant’s large open charcoal grill. Herbs are grown in the hotel’s kitchen garden and other ingredients are sourced locally from bio farms thus reducing the hotel’s carbon footprint while also offering guests something unique and tangible. Eisbär and I filled up on all the lovely fresh and organic goodies (and maybe a glass of bubbles or two for Dutch courage) and headed to the Ski Room to get ready to hit the slopes. Suited and booted we headed up the lift, Forsthofalm has ski-in, ski-out access to the Saalbach-Hinterglemm-Leogang skiing area which offers 124-miles of ski runs and 60 lifts so it’s really quick to be on piste and enjoying the snow this area has to offer. 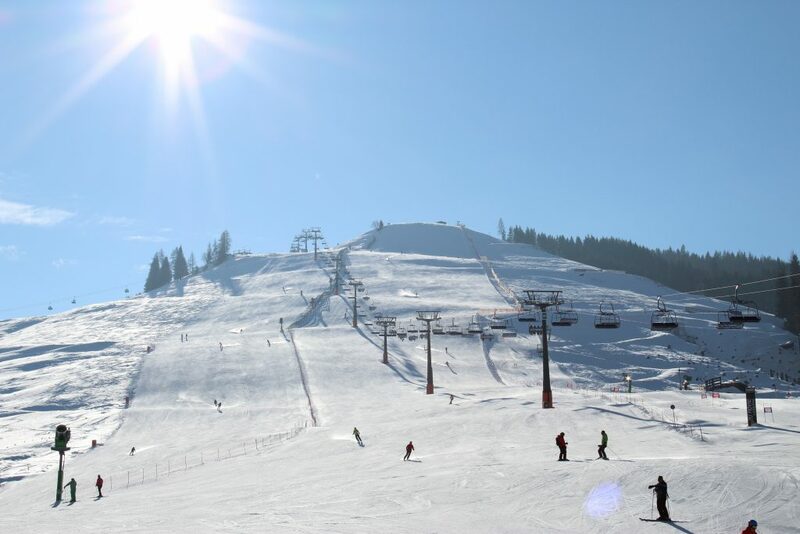 After a rather emotional first run it all came flooding back to me and the rest of the day was spent in pure bliss whizzing round the slopes of Leogang. Around 3pm we headed back to the hotel as they offer an “Afternoon Tea” for all guests where cold meats, vegetables and cakes are on display in KUKKA to replenish all those lost calories, Eisbär particularly liked the all you can eat concept, especially when it came to cake. 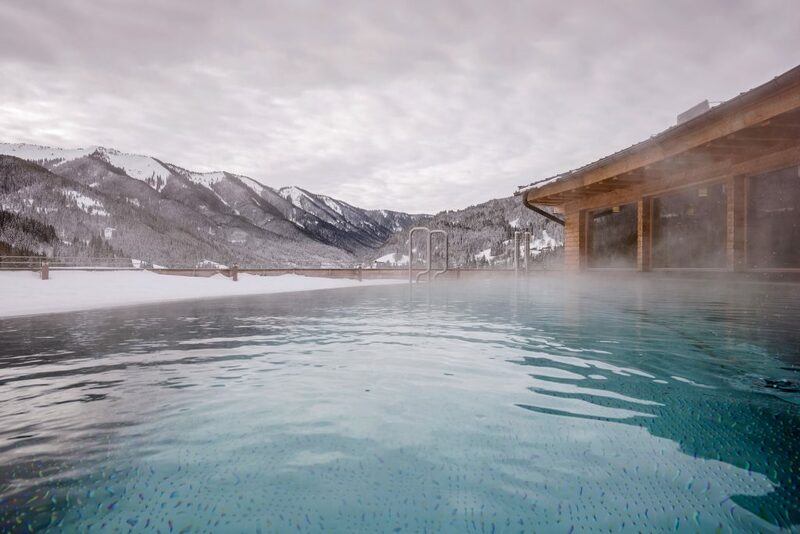 While at Holzhotel Forsthofalm we also checked out the Sky Spa located in the SPAnorama in the Alm (mountain hut) which offers yoga, a warm roof-top pool with a 360° mountain panorama view, spa wet facilities and spa treatments. Both Eisbär and I had fabulous massages using natural oils with herbs from the mountains picked locally, again the attention to detail as to being eco friendly is amazing and it does not distract from the luxury of this hotel but supports it through a rather unique concept. 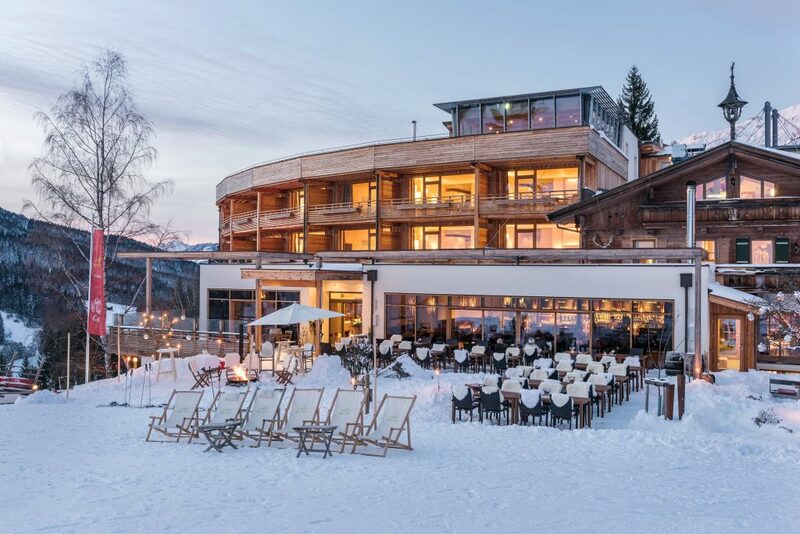 Holzhotel Forsthofalm is a rare gem; a luxury hotel in a popular ski resort but behind the striking design and 5 star facilities is a hotel with soul. The Widauer family are hands-on with guests sharing responsibility for managing the front of house, restaurant and spa which brings a homely feeling to the hotel despite its size. The building is visually stunning but is also eco friendly and sustainable and the construction also aids towards the wellbeing of the guests, much like the offerings from the restaurants which allows for any dietary preferences to be catered for and not as an afterthought. 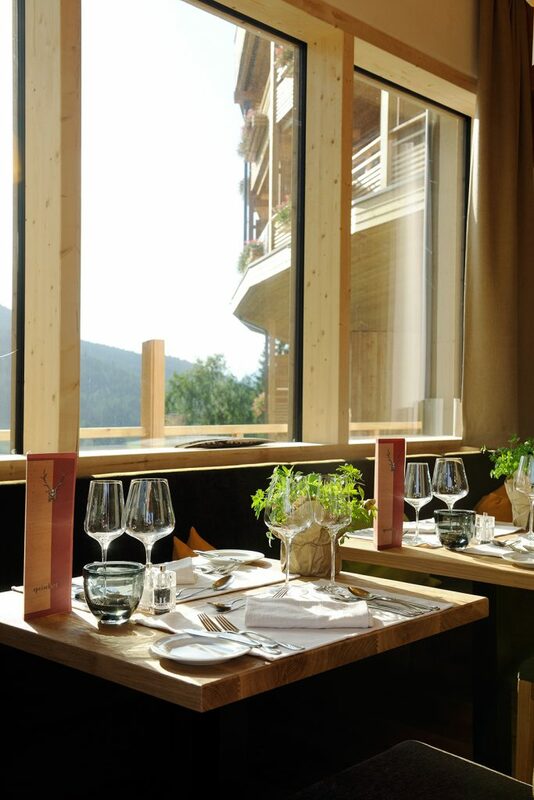 Holzhotel Forsthofalm is indeed in a league of its own; eco chic at its best and served with a friendly smile and a glass of biodynamic wine!